…and go back to school for a day. If anyone in the Massachusetts woody-plants world has not seen the latest in tree- and shrub-planting techniques, here’s your chance: on September 27, Rolf Briggs and Matt Foti will be giving a workshop entitled At The Root: Air Tools Workshop at the New England Wild Flower Society’s Garden In The Woods. Matt and Rolf will discuss and show the best techniques for planting trees and shrubs fresh from the nursery (air tools not necessary for this), as well as how to use air tools to trench under trees, decompact soil, and transplant trees. I have my reasons to promote this workshop (and it’s next-day partner, At The Root: Understanding and Managing Healthy Soils), and they center on the fact that every planting season I find myself coaching laborers on how to deal with the root balls of plants that we’re planting on my job sites. The boss, not knowing or having taught his laborers the proper planting techniques, usually has priced the work based on a quick installation (dig the hole, stick the plant in, cover up the root ball, basket, and burlap), and the laborers, knowing only the quick and dirty method, look sideways at me as I show them what I want them to do. The guys do the work the way I want it, but really, the process would go much more smoothly, and more landscapes would establish and grow in better, if everyone knew , priced, and carried out the work in what are considered the most plant-friendly ways. Some of the most effective tools available to see what can be considered plant-friendly, and to work in soil crowded with roots, are pneumatic air tools. I believe that Rolf and Matt will be transplanting a tree bare-root, using air, which will afford workshop attendees a chance to see what a tree’s roots really look like when the soil is blown away. It’s an experience that can change how anyone working with plants understands how a plant grows and anchors itself, and for that alone this workshop is worth attending. Watering in a newly planted tree-form Taxus from Weston Nurseries. Last week I was driving through a shady and pleasant part of Wellesley, MA, enjoying the really stunning show of fall colors. One bucolic road was flanked on one side by a steep wooded hill, at the bottom of which a small stream flowed next to the road. I noticed that the brightest colors came in that stretch from an almost continuous line of Euonymus alatus, commonly known as Burning Bush or Winged Wahoo (Yes! I couldn’t resist giving this one of its names.). A few were still green, some had turned brilliant red, and in some that robust red had drained out, leaving the foliage looking delicately pale and anemic. I don’t believe any of those Euonymus had been intentionally planted there; more likely birds had eaten fruit from some nearby cultivated Euonymus alatus shrubs, the seeds survived digestion, and found a hospitable niche next to the stream. Right around the bend from the stream was this beefy looking Burning Bush, an obviously well-tended accent in someone's yard. The scene was lovely, but it was repeated all over the woodlands in that area of town — great color, and large quantities of this non-native and now-invasive shrub. It’s at this time of year that the ubiquity of some invasives become really evident (Oriental Bittersweet — also a member of the Celastraceae family — is another). Visually, it’s a wonderful treat; ecologically, perhaps a little more challenging. Euonymus alatus is now on the Massachusetts Prohibited Plant List, which means that nurseries are prohibited from growing or selling it in the state. What had been a typical street tree -- a standard-form Honey Locust -- was cut down at some point, and now sports shrub-like topgrowth. Both trees work hard under severe limitations. The far tree shows what the nearer tree could have looked like. How well these characters are doing is a direct consequence of how well they’re being cared for, and of their native vitality. The far tree is impressive for its growth despite the tiny volume of root space available for it; the near tree admirable for its persistence. At the MAA Elm Bank workshop on September 10, 2009, Matt Foti demonstrated how to address root problems at the time of planting. He had a fairly large collection of trunk-and-root masses to illustrate his points, and used them to show how girdling roots, secondary root systems, and J-rooted systems can develop as a result of poor planting or growing practices. Matt first showed a couple of forest saplings he had pulled early in the day to illustrate how a naturally-seeded tree’s roots grow. The sapling’s roots were evenly spaced around its stem, and extended out a distance relatively equivalent to the distance its topgrowth extended from the stem. This little forest-grown white pine has a clean, evenly spaced root system. He then pointed to a couple of nursery-grown trees whose rooting problems had become evident after several years. These root systems have been cut in the digging process. In an attempt to regrow roots, the foreground tree has sent out a secondary root system, several of which are beginning to girdle other roots. Kept too long in a burlapped ball or in a container, roots will often turn back in to the ball, making effective planting and long-term growth problematic. Shrubs as well as trees are susceptible to root problems; Matt dismantled an Ilex verticillata root mass to illustrate how he treats roots bound in a container or in burlap before planting. Fibrous roots hold together in a near solid mass right out of the container. Using a three-pronged fork to untangle the root mass. For a bigger shrub or small tree, a machete or pitchfork may work well to loosen soil and reorient roots. Ilex verticillata root mass, now ready for planting. Soil can present another problem for nursery-dug B&B trees. Clay soils make sturdy root balls, which can be useful for shipping, but not so great for root growth. This pair of trees have root masses encased in rock-hard clay soils. Note the solid clumps of clay in the foreground, and root growth only on top of the root ball -- these roots found it impossible to grow into and through this soil. Breaking up the soil in a root ball like this before planting promotes the tree's future health; leaving this kind of root ball intact almost guarantees tree stress and decline. Closeup of rock-hard clay root ball, broken apart (fairly violently) for demonstration purposes. The point of these illustrations was to show how necessary it is, when planting a tree or shrub, to work with the root ball before covering it with soil. Removing wire baskets, removing burlap, loosening or removing the soil, untangling roots as best as possible, pruning roots when necessary — all these tactics make up a strategy for promoting real tree growth. Bare-root techniques have shown that a great deal of the work that arborists do these days is remedial — that is, is work intended to remedy poor growing, digging, or planting practices. With the knowledge arborists now have of how root issues so obviously affect plant health, it only makes sense to attend to those issues early on, to avoid greater problems later. This past winter I developed plans for a couple of areas on the property belonging to my longest-standing and wonderfully enthusiastic clients, L. and A. on the North Shore. They have a lovely place on a rocky cliff overlooking Nahant Bay, and they enjoy making it even more beautiful and comfortable each year. They are both artists, and both appreciate art in two and three dimensions: L. gardens and sculpts; A. is a talented photographer. L. and A. had asked me to figure out how to screen out views of two neighbors from their house, and to develop plans in the two areas that would work with the extensive mature plantings already in place. I drew up plans that would bring a few new plants in, as well as reuse a number of plants already onsite. L. and A. liked the ideas, and we scheduled a date to move ahead. Leahy Landscaping of Lynn carried out the work of digging and moving the plants; the crew, led by Anibal Marita, was excellent. At my request, and under the supervision of Mark Bolcome, Leahy’s arborist, they used an air spade on the project; we were working in a heavily planted area and I wanted to disturb or lose as few roots as possible. The plan: Remove a 32′ long, 7′ high holly (<em>Ilex ‘China Girl'</em>) hedge from the edge of a residential drive court, reusing some of the plants for screening at the front property line, and install a collection of transplanted shrubs, a new Japanese maple, and some low Green Wave yews where the holly had been. Transplant most of the hollies to provide a 22’ long screen at the front property line, and use the rest at another location onsite. Proposed methods: Hand-dig the holly. To avoid further stressing the three aging red pines under which some of the hollies were to be transplanted, excavate the transplant site with an air spade. Hand-dig the rest of the plants. Actual methods: Hand-dug the holly, then air spaded the root balls to loosen the nursery soil at their cores. Discovered that the wire baskets had not been removed at the original planting, removed those, and loosened the remaining soil, leaving roots intact. Removing the soil allowed the plants to fit in shallower-depth holes, which was helpful on a site with a lot of existing tree roots and drainage pipes. Removing the wire baskets will allow the hollies’ roots (and crowns) to grow unimpeded in their new locations. Excavated under the pines with the air spade, and removed existing shrubs there also with the air spade, leaving all roots, including masses of feeder roots, intact. Unwrapped the Japanese maple root ball, removed the wire basket and burlap, and removed/loosened the soil with the air spade. Removing a girdling root from the Japanese maple. Note the root-ball soil line, four inches up the tree's trunk from the base of the trunk flare. With a mini-claw mattock, pulled soil away from the trunk flare; soil had been piled 4″ up the trunk, concealing a girdling root and the flare itself. Mark Bolcome chiseled away the girdling root and made sure the flare was correctly exposed before laborers backfilled and watered in the root ball. Removed the red clay soil encasing the nursery root ball of a rhododendron that had been planted onsite several years ago, but that had struggled for those years. Breaking up the clay soil in the root ball of a 4' rhododendron. With the concrete-like soil mostly gone, the plant should finally have a chance to spend its energy growing, rather than trying to break through that clay cast. Holes for holly transplants were dug by air spade, to minimize disturbance to the roots of the treeform yew hedge behind the plywood. then excavated transplant holes with the air spade — again, to keep from disturbing roots of the existing yews — and transplanted more of the holly here. The original plan, which also included the planting of six large clump bamboos and the moving of several broadleaf evergreen and herbaceous plant, was scheduled to take perhaps two days. The hollies changed everything, though. They were enormous: planted eight or nine years ago at 3′ on center, they opened out to seven to eight feet in width. One holly, trussed for moving. Ten of these plants had been placed on 3' centers to make a hedge; when freed from the hedge, each one opened out to cover at least seven feet in breadth. There was no way we could fit them all where we had intended; they would have taken up more than seventy linear feet if we had placed them side by side! Hand-dug holly that has been bare-rooted being prepared for transplant. Notice the clumps of hard, heavy soil from its original root ball lying around it; the wire basket is lying off to the left. The trussed holly, now untied and moved to the planting bed, is at the back right of the photo. Liberated from the crush of a too-tight hedge planting, it has opened out to cover almost nine feet of fence. So it took a while to figure out where to put them, and then more time preparing those new locations to receive them. We ended up placing them — ten from the hedge, plus a shorter male plant — at various points around the property’s edge, where they do a magnificent job of screening out the neighbors. 1. An air spade is a great tool for any kind of planting work. We tested its capabilities, and found it invaluable for working under trees, for bare-rooting new plants, for excavating existing shrubs, and for removing that dreadful red clay soil from the 4′ rhododendron. We used it to investigate suspicious root issues — that concrete-like slug encasing the rhody’s root mass, the hollies’ wire baskets, the Japanese maple’s buried root flare and girdling root — and when it wasn’t being used on the transplanting operation, we used it to give a little breathing room to the root flare of a river birch planted on site a few years ago. On this particular site, which has been intensively gardened for decades, the soil is beautifully dark and rock-free. The air spade had no difficulty blowing it out of planting holes. Even with a rockier soil, an air spade has enough pressure (90 psig) that bare-rooting shrubs takes a relatively short time. 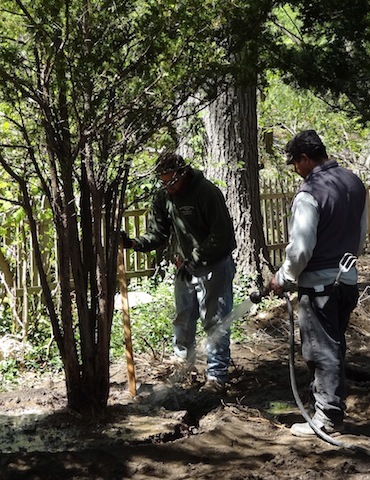 A laborer team can generally dig a 4-5′ broadleaf evergreen shrub in minutes. An air spade can do it as quickly or in a few more minutes, depending on soil type — but the amount of root mass saved makes the air spade by far the preferred method, horticulturally. 2. Plywood screens work beautifully to confine the overspray of soil from the spading site. For bare-rooting the already-dug hollies, the landscapers figured out that they could lift each plant into the back of their high-sided truck and spade off the root soil there, which kept the soil contained and the site clean. 3. At a minimum, workers using the air spade or helping with the bare-rooting should wear goggles and a face mask; very fine particles of soil spray everywhere at high pressure, and eyes and lungs should be protected. In rocky or sandy soil, the hazard is greater, and long sleeves and protective visored helmets are a good idea. 4. Never plant China Girl hollies that close together. They have a lush and luxuriant round form, and are determined to grow to that form (shrubs will push to grow into their particular habits — with some, you can push back by hedging them, but it makes sense to pick a variety whose natural habit lends itself to hedge form). Ten hollies had been planted at 3\’ o.c. to make a hedge; when removed from hedge configuration, the plants spread to between seven and nine feet in breadth. These plants now make a contribution to the landscape that they couldn’t in hedge form. L. couldn’t remember if the original plan, done by another LA, had called for China Girls or for some other holly, and wondered if the contractor might have substituted China Girls for something else. We’ll never know — but we’ll know what to avoid in future. Conclusion: The planting techniques were first-rate, the plants looked happy, the place looked great. L. and A. are delighted with the results (I know I’ve succeeded when I’ve pleased their artists’ eyes), and Leahy is moving on to do other air spade projects, knowing how well the technique works in a number of different situations. Now we’ll all be watching to see how everything grows; I’m betting they will all thrive.